Mira Jacob’s sumptuous debut novel The Sleepwalker’s Guide to Dancing is a heartbreaking and hilarious story of a family in flux in the heat of a New Mexico summer. Basking in positive reviews and attention, she reveals that life as an overnight literary sensation is not always as it seems. Today is almost exactly two months from the launch of my first novel. It came out with a lovely party, and the publication of an article I wrote for Vogue, which features a picture of me wearing an impossibly chic dress and laughing as if I am the kind of carefree sophisticate who lunches in French cafes and winters in sainted islands. In reality, I am the kind of carefree sophisticate who spent the entire shoot in a quiet panic over wearing dresses more expensive than my car, a second-hand 1996 Camry, which is why, I suppose, I have found myself looking at the picture opposite a lot lately. Taken by my husband (standing just off to the side, winking conspiratorially at me as stylists discussed whether the ring they’d placed on my pinkie finger worked with my chignon and ‘lip’), it shows the moment as I remember it: my falling-apart sneakers hidden from view under the table, the enormous softbox looming like some alien pupa, the bemused looks from my neighbors because of course we were not in Paris but at my local coffee shop in Brooklyn, where I had spent the last decade alternately writing my novel and panicking that no one would ever publish it. It was a day of disorienting newness, of being both inside and outside of my own body, and I’ve come to see it as the harbinger of the months that came after. Here’s the funny truth of working on one book for ten years: At some point, it becomes more than a book. It becomes your counterpart, your shadow self, your pressing-but-invisible reality. Even in your most vividly present moments – taking your wedding vows, learning how to nurse for the first time, stopping the ambulance that has come for your father with a ‘Do Not Resuscitate’ order – there is another, equal you that is somewhere else entirely, dreaming up another house and its inhabitants and heartbreaks. Add to that the funny and sad realities of putting that book out into the world (that your relief will be tempered by disbelief and its less generous cousin, paranoia; that your emotional stability in the months post-publication will be based on things as unreliable as your news feed, your Amazon ranking, and the amount of eye contact you’ve had with other sentient beings) and you’ve got a full mind-body split. I won’t pretend I was anything other than thrilled and relieved when the novel sold – I’d been laid off a few months before, I have a child to support, and I’m far too familiar with the unpredictability of the publishing world to take a stroke of good luck for granted. But every rave, every criticism, every list it does or doesn’t make is followed by a necessary distancing, assessing and recalibrating. The book has become – painfully, necessarily, and yes, of course, thankfully – theirs and not mine. And in that way it has split into two books, the one I that only I could enter for years, and the one that is waiting on the shelves for anyone to pick it up. Which is, I suppose, what I really love about this picture – that it captures the moment in between, when I was just starting to understand what that separation would look like. What it looks like, it turns out, is a woman in a borrowed dress and her own grubby shoes, wondering if this is the beginning of a longer moment in the sun, or just a quick glimpse of daylight from a coffee shop window. Mira Jacob was the co-founder of Pete’s Reading Series in Brooklyn, where she spent 13 years bringing literary fiction, non-fiction, and poetry to the stage, and has a MFA from the New School for Social Research. Previously, she directed editorial content for various websites, co-authored shoe impresario Kenneth Cole’s autobiography, and wrote VH-1’s Pop-Up Video. Her writing has been published in books, magazines, on television and across the web. She has appeared on national and local television and radio, and has taught writing to students of all ages in New York, New Mexico and Barcelona. 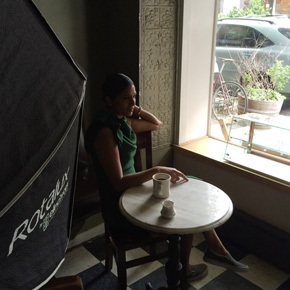 She lives in Brooklyn with her husband, documentary filmmaker Jed Rothstein, and their son. 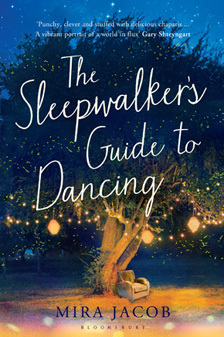 The Sleepwalker’s Guide to Dancing is published in the UK by Bloomsbury. Read more.